As host of her own show on Fox for many years, Judge Jeanine Pirro has seen firsthand how narratives take form, whether they are based in truth or not. In her explosive new book, she will write about some of the most egregious lies she’s seen, and take on the Liars, Leakers, and Liberals. 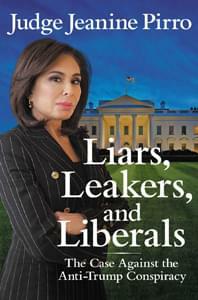 Liars, Leakers, and Liberals: The Case Against the Anti-Trump Conspiracy by Jeanine Pirro, available from Amazon.com.